So I had a Malware attack yesterday. I found your useful instructions, downloaded tons of Anti-Spyware programms and got to this end result. I've attached my HiJack output and Super AntiSpyware Log and would be grateful for your help in cleaning up my computer. O4 - HKLM\..\Run: [SunJavaUpdateSched] "C:\Program Files\Java\j2re1.4.2_03\bin\jusched.exe"
O4 - HKLM\..\Run: [IntelZeroConfig] "C:\Program Files\Intel\Wireless\bin\ZCfgSvc.exe"
O4 - HKLM\..\Run: [SynTPEnh] "C:\Program Files\Synaptics\SynTP\SynTPEnh.exe"
O4 - HKCU\..\Run: [SUPERAntiSpyware] "C:\Program Files\SUPERAntiSpyware\SUPERAntiSpyware.exe"
Now close all windows and browsers, other than HiJackThis, then click Fix Checked. Go to the Control Panel. Click on the JAVA icon. Under Temporary Internet Files, click on Settings. Click on Delete Files, then Ok, out of the properties window. Scroll down to where it says "The J2SE Runtime Environment (JRE) allows end-users to run Java applications". Click the "Download" button to the right. Check the box that says: "Accept License Agreement". Then from your desktop double-click on the download to install the newest version. If present, click on the entry and click remove. Thanks for taking the time to look at my case. After following yours, and the Master topic advice, my computer is much better, back to normal. But I've attached the HiJack Log and the Combo fix thing. 2008-03-15 20:55 . 2008-03-15 20:55	<DIR>	d--------	C:\Program Files\STOPzilla! 2008-03-15 20:54 . 2008-03-17 16:12	<DIR>	d--------	C:\Documents and Settings\All Users\Application Data\STOPzilla! "2008-03-17 16:12:24 C:\WINDOWS\Tasks\MP Scheduled Scan.job"
There still some suspicious files and folders. Copy the entire contents of the Quote Box below to Notepad. and Save it next to Combofix. Once saved, referring to the picture above, drag CFScript.txt into ComboFix.exe, and post back the resulting report. Thanks for your reply. Followed your instructions - here is the output. 2008-03-15 20:54 . 2008-03-17 19:08	<DIR>	d--------	C:\Documents and Settings\All Users\Application Data\STOPzilla! - Not a PE file. "2008-03-17 18:59:29 C:\WINDOWS\Tasks\MP Scheduled Scan.job"
I did follow your instuctions, this and last time, but it doesn't seem to do the information below the File line. 2008-03-15 20:54 . 2008-03-18 10:26	<DIR>	d--------	C:\Documents and Settings\All Users\Application Data\STOPzilla! "2008-03-18 10:06:19 C:\WINDOWS\Tasks\MP Scheduled Scan.job"
You did good. All files and folders were removed. Go to Start->Run, type %TEMP% and click OK. The TEMP folder will be displayed. Delete all files and folders therein. The rest looks clear. How is the computer doing? Yep that's great, thanks for your help. Its amazing the time it takes to sort out an Malware attack. The one odd thing is now, when I try to log into Lycos, the computer doesnt recognise the Sign-In button. It recognises all buttons, but with Sign -In, it just ignores it - almost some secruity thing could be blocking it - Do I need to adjust sometype of Java/Security setting? It could be a Security Setting or a corrupted CACHE. Please download ATF Cleaner by Atribune. 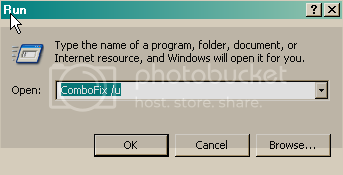 This program is for XP and Windows 2000 onlyDouble-click ATF-Cleaner.exe to run the program. That should clear your CACHE. Restart the computer and test. Yes cleared the cache, but no difference. It must be a security issue because I can access my lycos mail on another computer, but when I click on log-in, nothing happens. And this problem only started when I've started doing Anti-Spyware stuff. Could it be that I've removed a particular security/java file? In the Internet Options window, select the Security tab (at the top of the window). Under the Security tab, select each zone and click on Default. Click Apply, then OK out of the properties window. You must also check if there is a conflict among your security programs. I would suggest you disable all your security programs, except for your Antivirus, and test. Just a simple click back to Default level and the problem is fixed. Great, many thanks for taking the time to help me, and my computer seems back to normal now. Click Apply, and then click OK.. Since the tools we used to scan the computer, as well as tools to delete files and folders, are no longer needed, they should be removed, as well as the folders created by these tools. Click Start, point to All Programs, point to Accessories, point to System Tools, and then click System Restore. In the System Restore dialog box, click Create a restore point, and then click Next. Type a description for your restore point, such as "After Cleanup", then click Create. ZonedOut + IE-SpyAd - puts over 5000 sites in your restricted zone so you'll be protected when you visit innocent-looking sites that aren't actually innocent at all. CleanUP! - Cleans temporary files from IE and Windows, empties the recycle bin and more. Great tool to help speed up your computer and knock out those nasties that like to reside in the temp folders. ERUNT (Emergency Recovery Utility NT) allows you to keep a complete backup of your registry and restore it when needed. The standard registry backup options that come with Windows back up most of the registry but not all of it. ERUNT however creates a complete backup set, including the Security hive and user related sections. ERUNT is easy to use and since it creates a full backup, there are no options or choices other than to select the location of the backup files. The backup set includes a small executable that will launch the registry restore if needed. Recovery Console - Recent trends appear to indicate that future infections will include attacks to the boot sector of the computer. The installation of the Recovery Console in the computer will be our only defense against this threat. For more information and steps to install the Recovery Console see This Article. Should you need assistance in installing the Recovery Console, please do not hesitate to ask. To find out more information about how you got infected in the first place and some great guidelines to follow to prevent future infections you can read this article by Tony Klein.